Apparently, today is National Candy Corn Day. I almost missed it! "The National Confectioners Association estimates that 20 million pounds (9000 tons) of candy corn are sold annually. The top branded retailer of candy corn, Brach's sells enough candy corn each year to circle the earth 4.25 times if the kernels were laid end to end." Yikes! That's a whole lot of candy corn. Personally, I haven't eaten a piece of candy corn in over 20 years. But I did spot this fun idea for a candle centerpiece on Pinterest to celebrate fall at the coast. Pretty darn easy to create something fun for a Halloween Centerpiece! 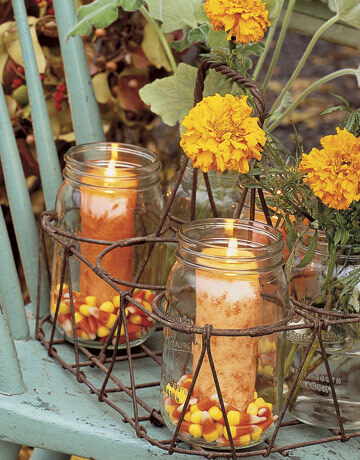 Mason Jars, Fall colored candles and candy corns. For something a little more "beachy" think about mixing it up with vintage aqua jars!